“Take pride in how far you've come. I agree with Kimberly, which is why I ask so many questions in the success story interviews I share on this blog. It's also why I interview people who have reached remission, but also those who haven't. There are lots of points to celebrate along the path to healing. Perfection isn't the only definition of success. Today I'd like to introduce you to a strong, persistent, wise and beautiful woman, Christie Stallings. She has psoriasis, an autoimmune disease that causes skin cells to grow too quickly. New cells form in days rather than weeks, but the body doesn't shed them at the same pace, so they pile up in red, scaly patches. In a society so focused on appearance, these symptoms can evoke feelings of shame, vulnerability and a frustrating lack of control. Christie speaks with honesty about how incredibly grateful she is for the many ways her health has improved through the paleo diet and lifestyle, but also the grief she feels when a setback occurs. 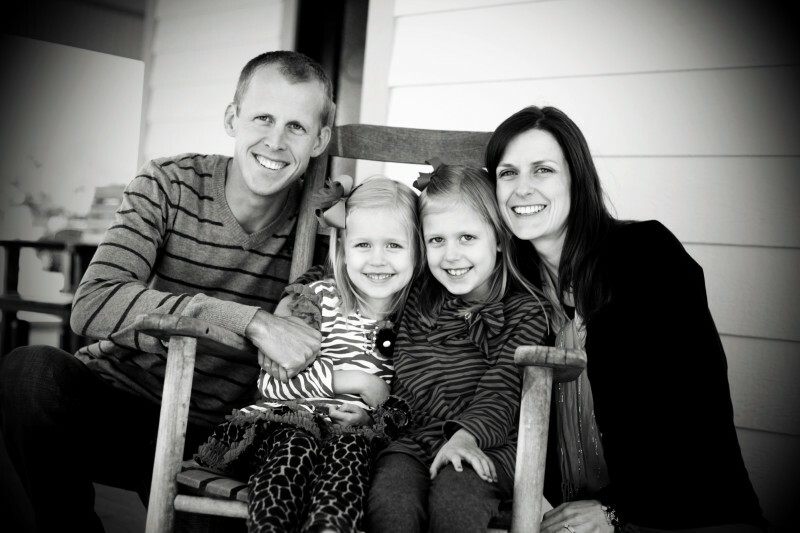 She hasn't achieved remission, but she also hasn't given up hope. My first symptom was an itchy, flaky spot on the base of my neck when I was pregnant with my second child. I had it for a few months before going to the doctor, and she diagnosed it as seborrheic dermatitis. Two weeks after the birth, I suddenly had these itchy flaky spots all over my scalp, and I was absolutely miserable. I tried every over-the-counter and prescription shampoo I could find, and I kept getting worse. A year later, my torso was covered in spots. I then went to a dermatologist and was diagnosed with psoriasis. What treatment methods did you try first? The dermatologist prescribed a foam steroid to me, and my husband helped me apply it twice a day to my scalp and back. It was stinky, it burned, and my head was a big ball of flakes. I knew I had to find a way to heal my body. In addition to the psoriasis, I had chronic fatigue, migraines, and I also struggled with severe anxiety and depression. I was taking Zoloft and Xanax several times a day just to survive. I couldn’t take my kids to the park or the grocery store for fear of another panic attack. I even had panic attacks every Sunday during church! 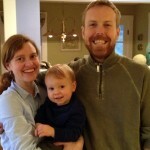 I didn’t want to be alone in my own house with my children, because I was scared of what my body was going to do next. I was going to the doctor every week looking for answers. I was seeing a psychiatrist trying to figure out why I was so anxious and depressed. 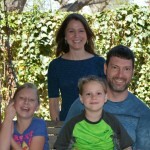 I had two beautiful children and the perfect husband, but I was miserable. In the summer of 2009, I ended up in the emergency room thinking I was having a heart attack. Which healing diet(s) did you choose and how fast did you see results? When I started researching psoriasis, I kept seeing over and over that there was no known cause and no known cure. I kept looking for information, believing that my body was trying to warn me that something was wrong, and I wanted to figure it out. I finally stumbled onto an article that said to stop eating gluten and dairy. I had always fed my family “healthy” or what I believed was healthy. We had our healthy dose of grains and our antibiotic filled milk several times per day, one green vegetable with each meal (usually canned green beans) and we stayed far away from high fructose corn syrup and partially hydrogenated oils. After reading about the gluten and dairy, I headed off to our nearest health food store and loaded up on vanilla soy milk, gluten free breads, pastas, crackers, etc. I thought this was the answer to my problems! I guess it was in 2012 that I stumbled onto the Paleo diet through a mommy Facebook group and started to slowly realize where my downfalls were as far as our diet was concerned. I went through the period I think a lot of people go through, where I was “paleoizing” the Standard American Diet. We still had pancakes, pizza, brownies, etc. and had them quite frequently. I was just using alternative flours that were “grain free”. Little by little we made changes as we educated ourselves more and more. In January of 2013 I stumbled upon The Paleo Mom‘s website and learned about the autoimmune protocol (AIP). When I first started looking into it, I was scared and overwhelmed. I had all the initial feelings of “What in the world am I going to eat?!? Me eating liver?!? No way!” But I decided and gained the support of my family to start the AIP on February 15th, 2013. Again, it has been a progress of slow changes. In the beginning, I was still determined to find a way to have my sweets, and that’s okay if done correctly, but I was having them several times per day. I slowly changed my diet to include less of the “AIP sweets” and more of the vegetables, liver, chicken broth, etc. Each small change brought on a huge change in my health, both physically and mentally. How fast did I see results? 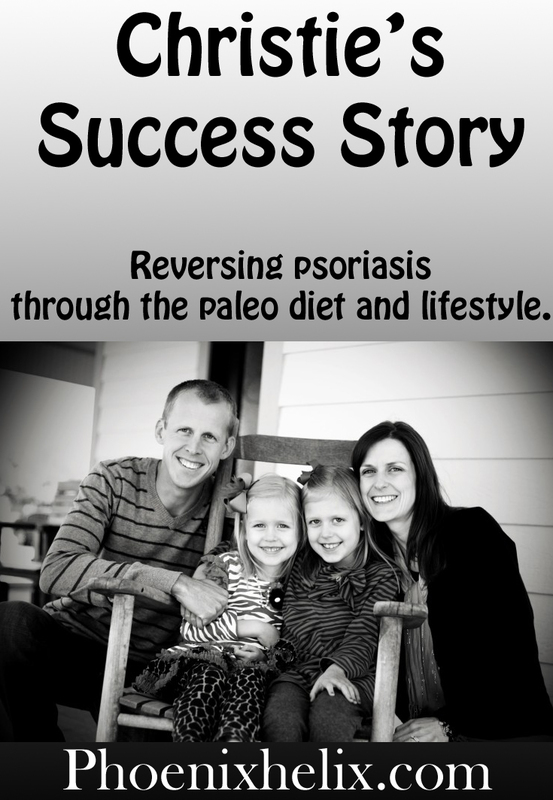 My psoriasis made small improvements when I went gluten free and another small improvement going paleo. But it wasn’t until I went AIP that I saw more dramatic results. Not only in my psoriasis but my general well being. In May of 2013, I suddenly had new spots on my face. I went to an Applied Kinesiologist and he found that I had toxic levels of Vitamin D. Very unusual in our culture, but I had been taking 5,000-10,000 IU of Vitamin D every day for over 3 years at that point, on the advice of my current doctor. Once I stopped taking it, my face cleared up within a week. The AK also found that I had an overgrowth of candida in my gut, as well as a parasite. I found that once those issues were corrected, my healing started in at a fast pace again. I've felt close to remission many times in the past year. I have very little psoriasis left on my scalp or torso. Why I get so close and then have a step backwards, I have no idea. I wish I knew. I wish I understood everything my body is trying to tell me. In October of 2013, I woke up with new spots all over my arms. This was devastating to me. My psoriasis had always been in areas that I could hide. I could hide the spots on my scalp with my hair and the spots on my torso with clothes. How was I going to hide the spots on my arms?!? Well, I did hide them all winter wearing long sleeves, but the weather has been in the 70’s the past 2 weeks, and I can’t hide anymore. When these types of things happen and there seems to be no answers, it’s so easy to get discouraged and even depressed. But when I get to that mental place, I remind myself of how far I’ve come. The truth is I don't think these spots are psoriasis. They don’t hurt, itch, anything. I forget I have them until I look in the mirror or wear short sleeves, and that's a big improvement from where I started. I can’t remember the last time I had a panic attack. I can’t even remember the last time I really worried about something. I don’t experience fatigue anymore. I don’t experience weakness or body aches or acne anymore. I no longer suffer from migraines. I don’t experience spikes and crashes with my blood sugar levels. My heart palpitations are very rare now. I don’t have stomach cramps anymore. I have energy, and I feel joyful and happy with my life, even when I face a setback. I wouldn't trade how I feel now for anything. I’ve stayed up late my whole life, and I’ve always been a pretty wired and stressed person. But after starting the AIP and reading The Paleo Mom’s blog and book, I realized how important sleep and stress management are. Instead of going to bed at 2am, I now go to bed at 10pm. It was a slow progress to break that bad habit. Once in a while I’ll think to myself, ‘I’ll stay up just this one night and get some things done that I’m behind on.' And I pay for it the next day: I’m tired, I don’t feel good, I don’t feel happy or have mental clarity much less any energy, and I tend to eat foods I shouldn’t eat. It seems silly to stay up an extra 4 hours to get things done, only to turn around and have a 12 hour day where absolutely nothing gets done. As for managing stress, instead of trying to get everything done every day, I prioritize and pick one thing that needs to be done. The other stuff can wait. Those small changes made a huge difference. I also make sure I play with my kids, make time for my marriage, exercise, get plenty of sunshine, and enjoy my life instead of focusing on the daily hassles. Lastly, I made some big changes in the products my family uses, right down to the chapstick we use and the fingernail polish I put on my children. 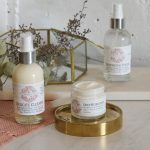 EWG's Skin Deep was a huge help in realizing how harmful our old products were, and helping me find healthy replacements. Are you on any over the counter or prescription medication now? If yes, how does it compare to what you were taking pre-diet? Before I started the AIP diet, I was taking Zoloft, Xanax, bio-identical progesterone, a “natural” Xanax, an adrenal supplement, and topical steroids. I don’t take anything now. I’m not on any supplements at the moment. I prefer to get everything I need from my diet, if I can. I make sure that I eat plenty of grass-fed beef for my omega balance. I eat liver every day as well as chicken broth, raw garlic, and gelatin. And of course as many vegetables as I can fit in a day. However, since I've had a healing setback, I've decided to add the following supplements back into my diet: magnesium, fish oil, and l-glutamine. They have helped me in the past. What foods have you been able to successfully reintroduce, and how long did you wait before doing reintroductions? I did try to reintroduce organic dairy last fall and that didn't go well! Other than that, I haven’t really reintroduced any foods. I’m happy with my diet, I feel good, and I don’t really have a desire to reintroduce anything at this point. I’ve always been pretty strict on the AIP. I’m an “All or Nothing” type of person so if I commit to doing something, I do it all the way. My only indulgence is a Virgil’s Cream Soda once a month, and that doesn’t seem to bother me. Other than that, I’ll eat some organic dried apple if I’m craving something crunchy and sweet. In the beginning, I missed the nuts and peppers and tomatoes. I wanted chocolate every day. And I did cheat several times at least with chocolate in the beginning. Luckily I ate enough chocolate that I felt sick, and I haven’t eaten any since then! The real challenge is eating at restaurants or at pot lucks. I steer clear of restaurants and if we travel, I make all my own food and load it up in a cooler. I take my own food to pot lucks as well. Pretty much my husband and children and mom, and one friend in particular that eats like we do. My sister goes out of her way to get organic eggs, organic salad and spinach, etc. when she has us over for dinner. And she’s very careful about what she feeds our children when they stay with her. Unfortunately, some other people think I'm stuck up, and some make fun of the food we eat because it’s “weird” which just blows my mind that meat, veggies, and fruits are weird! Others think we’re boring because we won’t eat out with them every week. And needless to say, we don’t get invited over to friend’s houses for dinner anymore. I think it’s overwhelming and confusing for them to figure out what to feed us, and I understand that. We try to invite people over to our house more now so we can still enjoy those times with friends. Is it hard at first? Yes, but it is so worth it. You just have to hit a point that you want to feel good every day and stop being miserable. Once you educate yourself about the foods you’re eating and realize what they are doing to your body, it's a easier to stop eating those foods. I also want to be a good example to my children. I want them to have the healthy start that I didn’t have. I want to keep them from dealing with autoimmune issues like I’ve dealt with. The week after she did this interview, Christie went to her dermatologist and confirmed the spots on her arms were indeed psoriasis. That's when Christie remembered she had reintroduced dairy just a few weeks before those spots appeared. She was enjoying the yogurt and ice cream so much, she continued to eat multiple bowls a day for 4 weeks before stopping. This is a great example of our capacity for denial, and I don't say that judgmentally. It's very human, and we've all been there! It's hard to accept food intolerance sometimes, both when it's happening, and making the connection after the fact. Autoimmune skin conditions often heal quite slowly, which is why Christie still has the spots on her arms, although they are starting to fade. If you have a setback in your healing, look closely at your diet and lifestyle. Can you find the reason? Sometimes it's right there; we just don't want to see it. 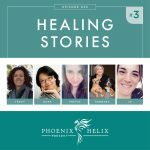 Thank you Christie for your honesty throughout this interview (and afterward), and your willingness to be a healing teacher through sharing both your successes and your setbacks. Christie also plans to work with a functional medicine practitioner to see if she can speed her healing.